Rant time! 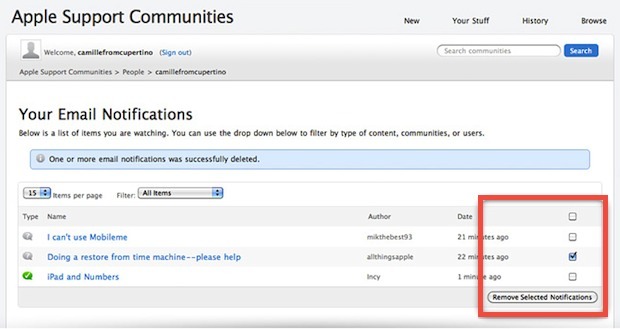 Waking up this morning to 49 new emails from “Apple Support Communities Updates” was less than pleasant, especially considering I had already unsubscribed from all email notifications the night before – or so I thought. Oddly enough you have to manually unsubscribe for every thread you participate in, so even if you have unsubscribed from other threads in the past but then participate in a new thread, you’ll have to do this again. But no, when you click on that link, you get a variety of checkboxes with “Yes” and “No” options to manage your email subscriptions – except they don’t seem to actually do anything. 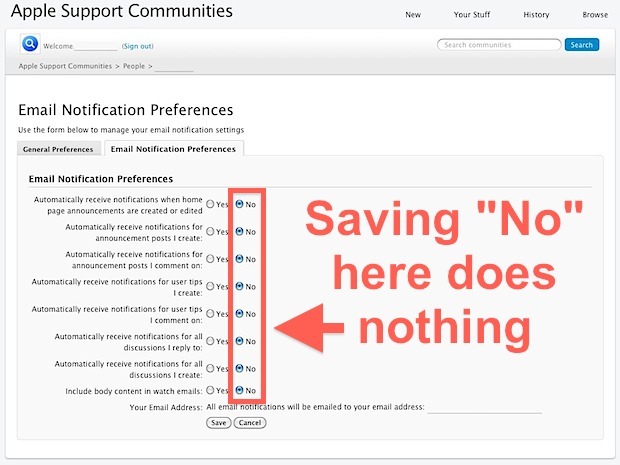 I saved “No” as my options after the first barrage of emails and continued to get inundated with more Apple Support Communities updates that I didn’t want. This was my first encounter with this, which I feel extra stupid about because a friend of mine recently complained about this exact issue. They complained about getting spammed by hundreds of Apple’s support emails after unsubscribing, to which I arrogantly replied “just click unsubscribe!” because it’s usually that simple with Apple, but not so here. Kind of stupid and very un-Applelike, it is annoying enough that Apple even has a separate tutorial on how to unsubscribe from emails and notifications. Maybe they should just make the initial “Unsubscribe” buttons actually work instead? OK, end of rant. I’ve heard that this is something being addressed, as it is less than ideal. Probably cropped up when Apple upgraded their support forums. Use of the red text combined with red arrows was of highest caliber ranting. Thanks for this – was having the same issue and it was driving me crazy. I enabled e-mails and got my question answered within about 30 minutes. Turned off e-mails, went out for the day, and then realized the e-mails kept coming…and coming and coming. I had to delete about 300 of them. So annyoing! This seems to have done the trick. Gotta love the Red Text thou in the Rant really good one. I had no idea they did it like this… But now that i know about this it is good to have manual control.. but its just the way they hidden this is strange.